Dear Birthmother by Kathleen Silber and Phyllis Speedlin. A guide to the open adoption process including actual letters between adoptive parents, birth parents and children. Restorative Grief: A Guide to Healing from Adoption by Cynthia Christensen. A Coloradan birth mother herself, Christensen shares how her faith in God lead to healing and acceptance of the decision to place her first child. https://www.cubirthparents.org/blogs.php A list of blogs for birth mothers for support and informational purposes. The Third Choice: A Woman’s Guide to Placing a Child for Adoption, Second Edition, by Leslie Foge and Gail Mosconi. 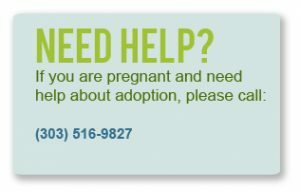 A comprehensive guide about adoption for birth parents. I Chose This Day: Mournings and Miracles of Adoption by Sharon Fieker. A true and personal account of the author meeting her grown-up biological daughter.